For ride manager Terry Woolley Howe, putting on a ride is all about the volunteers. 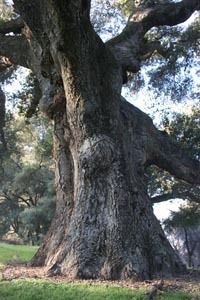 And she has a huge army of them helping at Warner Springs. She gets this army, she says, because the riders enjoy the ride. "When riders are happy, they treat the volunteers well; when volunteers are happy, they come to help, and the riders are happy." It's about 15 years now that Terry has put on the Warner Springs ride in the rolling foothills of Palomar Mountain (the 2004 National Championship was held here). 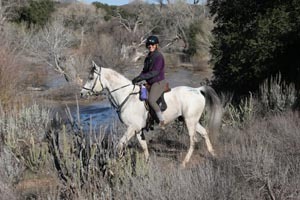 She also puts on the Descanso and Manzanita rides in the area. This one takes place on a piece of the Pacific Crest Trail, and part of the Warner Springs Ranch property, a resort a wee bit past its glory days since its establishment in 1844. It has cottages, an airport with glider rides, a golf course, and horse boarding; and it had a spa, bath and body boutique, tennis and golf pro shops. The property was recently sold, but has hung in litigation for some time (Terry wasn't sure she would be putting on the ride this year), and the resort is operating on a skeleton crew. However, the highlight of the resort, the pool-sized hot spring, is still open and fully accessible! 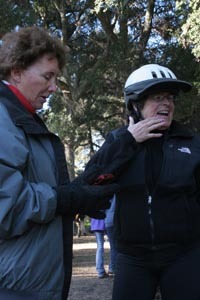 Ridecamp was in a horse campground under huge magnificent old oak trees, as were the vet checks. 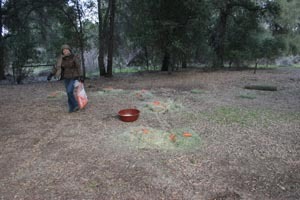 Volunteers created a heavenly stop for horses and riders - hay, carrots, and hot bran mash artfully laid out under the massive trees. 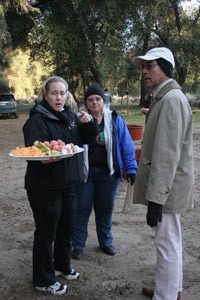 There was a heavenly spread of human sustenance too, for the hungry riders and volunteers - coffee, gatorade, donuts, sandwiches, egg salad, chips, fruit. A couple of girls walked around with trays of donuts, treats and drinks, at your service. 147 riders hit the trails on a cool, partly overcast (but no rain!) Saturday - 93 of them in the 25-miler, 54 in the 50-miler. Twenty-five (!) riders did not finish the LD, and of those, all but two were overtime. "I have never had so many people overtime," Terry said. "At the pre-ride meeting I told everyone to take their time and enjoy the wonderful weather, the beautiful scenery and the cookie stops, and they evidently took it to heart. I told them unless they were actually going for points, it really didn't matter when they finished beceause their completion award would automatically convert to a participation award." 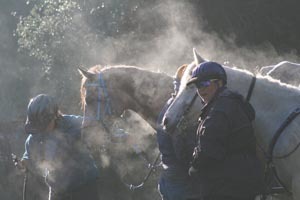 The LD winner was Geneva Pina on her Thoroughbred ex-racehorse Pie. She had a huge cheering section at the awards dinner. 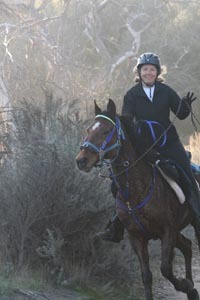 Lynne Glazer, who is usually behind the lens of her cameras shooting endurance rides, rode in one for the first time in 4 years. She rode the extraordinarily handsome stallion Biscotti+ ("Jimmy"), owned by Cynthia Binder, in the 25 miler, to his 16th ride completion. 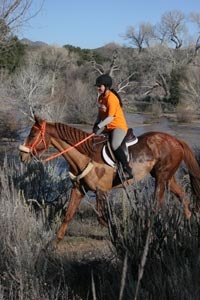 I felt some big pressure taking her photo, since she got some great ones of me at Tevis! 46 riders finished the 50, with Janet Worts on GC Finese winning first place and Best Condition. It was their 40th ride together with 39 finishes, and their 8th win in their 8-seaon partnership. Two Tevis buckles have come out that also. The hot springs pool was available to all, and after the two awards dinners Saturday evening, the pool was full of "ooooh! "s and "aaaaah! "s of deliriously relaxed riders and crews.